Want to know how much energy your refrigerator is using? What about that 50″ television? 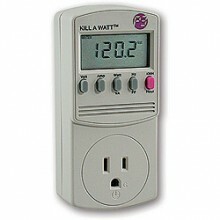 Simply plug an appliance into the Kill A Watt meter to measure the energy it uses and find out how efficient it really is. For $25 you can choose to borrow or purchase one from LaGrange County REMC. Return it undamaged within 30 days for a full refund.